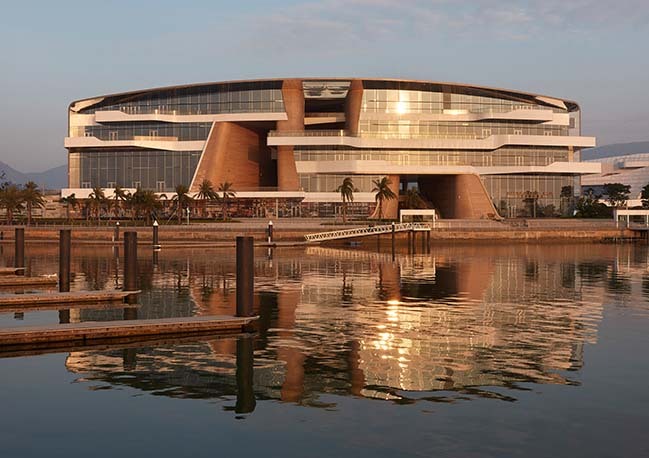 The Keppel Cove Marina & Clubhouse project has recently been completed by UNStudio Asia. 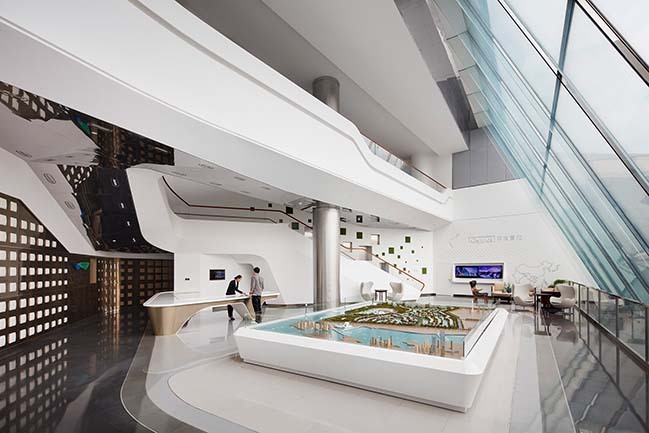 Headed up by responsible partner Hannes Pfau, UNStudio Asia consists of our Shanghai office - with a staff of 40 and 6 running projects - and our Hong Kong office, which has a staff of 15 currently overseeing 3 running projects. Project Team: Gordana Jakimovska, Joerg Lonkwitz, Adriana Rodriguez Ossio, Alexander Schramm, Alice Yi-Ting Chiu, Iris Pastor, Caroline Filice Smith, Jean Chaussavoine, Jun Wang, Irina Bogdan, Leo Xinyu Li, Gilles Greis, Alexander Meyers, Sam Jia Jun Ren, Tamim Salah EI Negm, Evan Jon Shieh, Rafael Carbonero Vicario. Team Members in different Project Phases: Alan Chin-Che Hung, Fernie Lai, Maya Alam, Cristina Gimenez, Juergen Heinzel, Yeojoon Yoon, Yu-Chen Liu, Dan Luo, Edwin Hang Jiang, Yichi ZHANG, Fabian Alejandr Mazzola, Daniele De Benedictis, Yuwei Wang, Alberto Martinez Garcia, Huaiming Liao, Ana patricia Castaingts Gomez, Oliver Loesser, Craig Yan, Guomin Lin, Nathan Melenbrink, Duran Yuan Zhai, Margaret Juien-Hwang, Cecilia Hui, Earn Lee Chern, Lukas Allner, Justin Tao Cheng, Severin Ignaz Tuerk, Yuwei Wang. 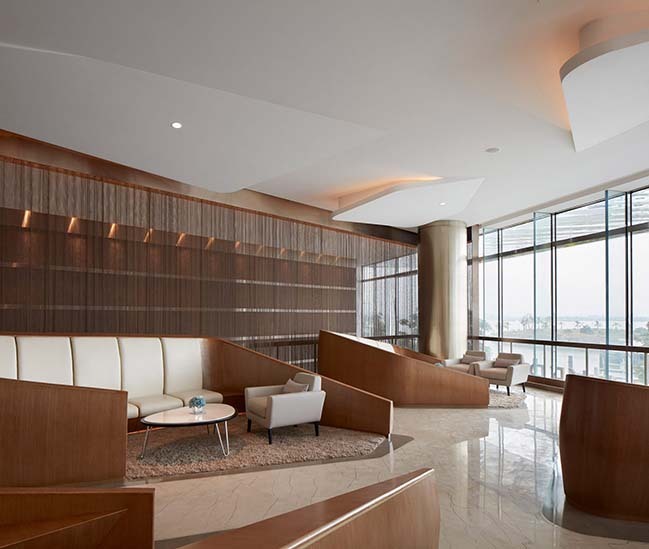 The Marina clubhouse is designed to resemble the experience of being on a yacht, or a luxury cruise. On the one hand it forms a retreat where people can disconnect from their busy daily lives and enjoy tranquillity and relaxation. On the other, it offers excitement and activity, alongside opportunities to escape and explore. The spatial and architectural concept for the clubhouse is to create a strong identity at the heart of the development. This is achieved by staging identity points from the entrance towards the river. The journey from the main entrance over the bridge towards the clubhouse and the visibility of the water and boats is designed to create an arc of suspense. 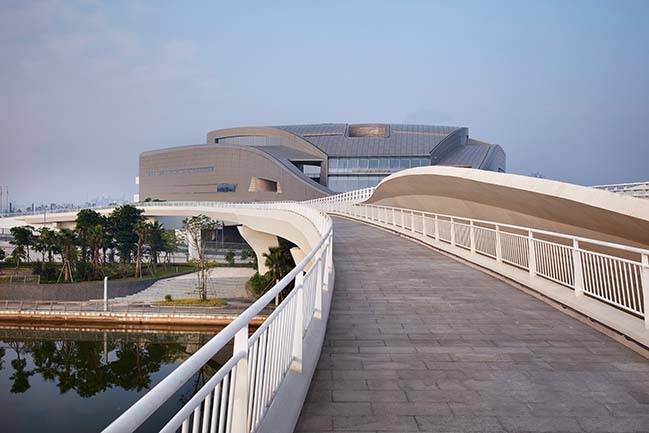 A contrasting approach to visual impact and the maritime notion of bridging land and sea was employed in the design. 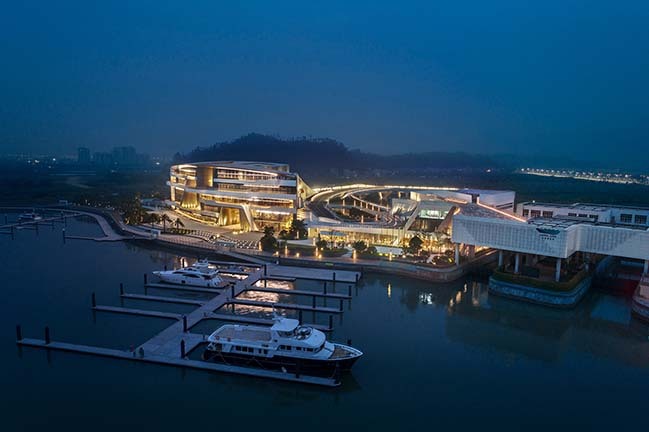 Whilst from the land side a sculptural landscape builds up gradually as you approach the clubhouse, from the water side a distinct and open facade welcomes seafarers while casting a shimmering reflection on the water. The shape of the building (and the surrounding landscape) was derived and developed based on the main access routes to the clubhouse, in combination with the most attractive view lines. 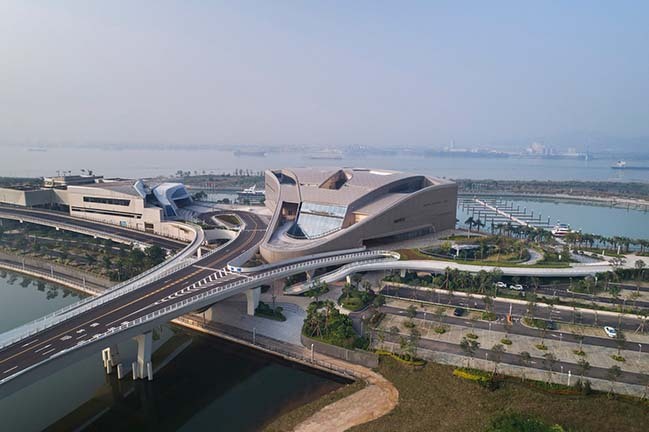 In a smooth transition, spaces radiate outwards in an organic fan shape, away from the main infrastructure node at the base of the ‘stalk’ (the bridge). 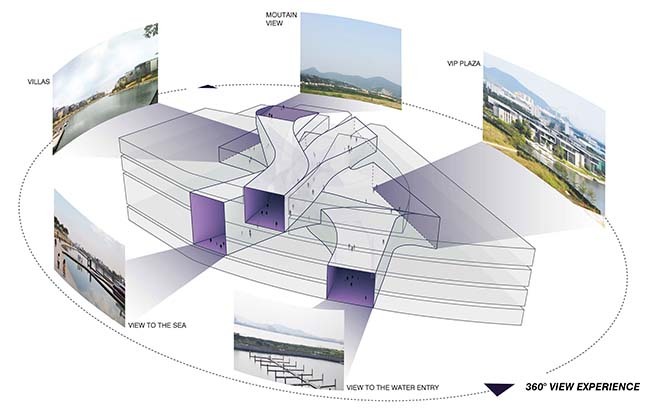 The design outcome of the fan shape is also a wide building frontage that takes maximum advantage of the marina view, while at the same time fluently guiding different user groups to their various destinations. 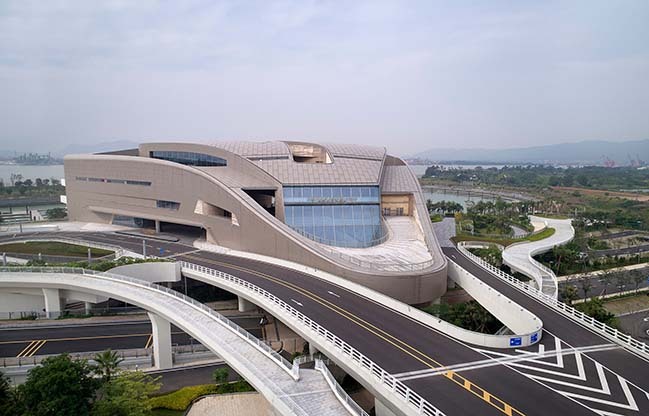 The landscape surrounding the building is designed and organised with respect to views of the surrounding environment: there are plateaus from which to experience and enjoy the river Xi and view points that connect people with the soft landscape of Shenwan. The architecture allows for these views to also be enjoyed by the public without infringing upon the privacy of exclusive users or residents. 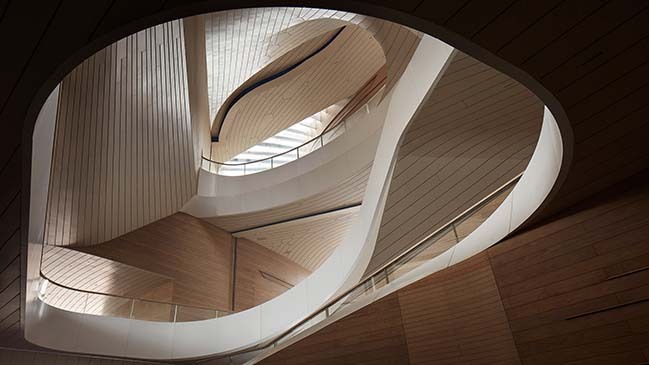 Large, open ‘funnel’ spaces cut through the building, whilst simultaneously forming vertical connections by means of staircases which allow access and strolling between the levels. 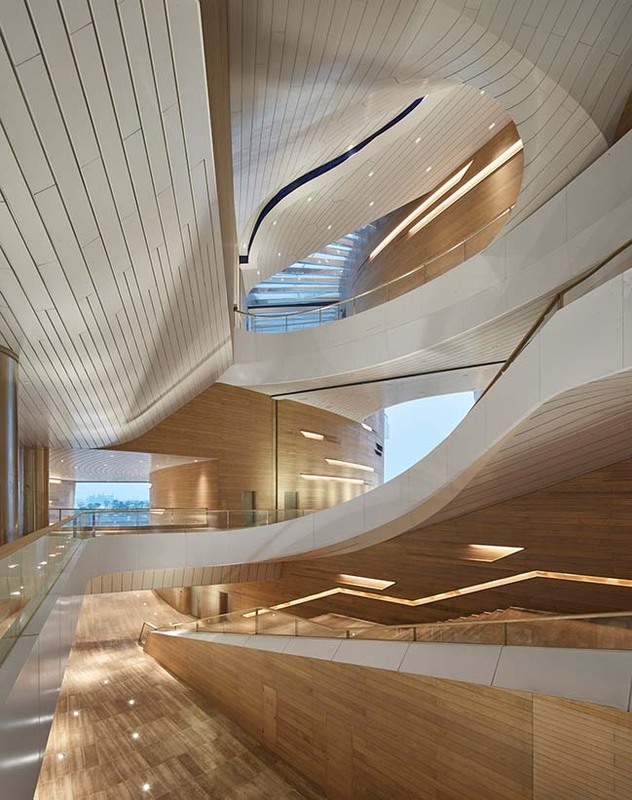 The Funnels change the typical notion of the building from an obstacle to the waterfront to a liquid space which allows for a seamless transition through the building’s volume. 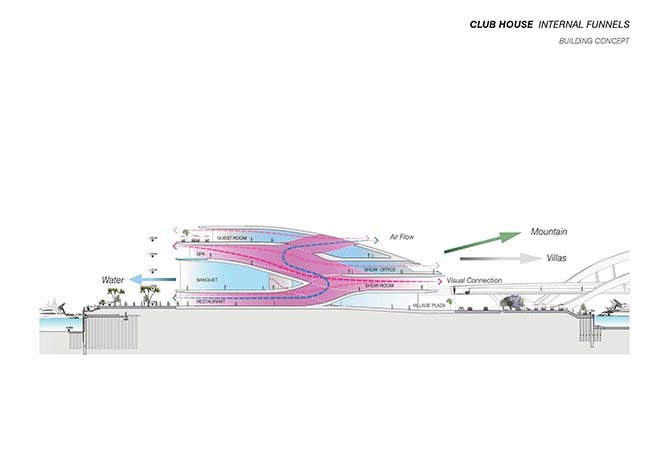 They form a permeable layer for walking from one side of the clubhouse to the other without interfering with the building’s programme and as such aid in the organisation of the interior spaces. Natural light entering through a large skylight and the East and West openings creates a comfortable atmosphere and offers a constant play between light and shadow. 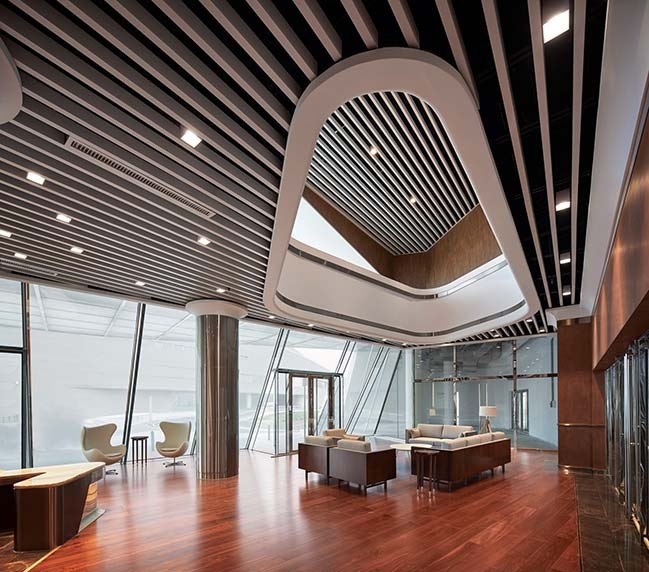 In these spaces wood panelling finishes reference the luxury yachts that are moored nearby - where the deck in many cases functions as a soft material contrast to the hard carbon fibre body of the vessels. 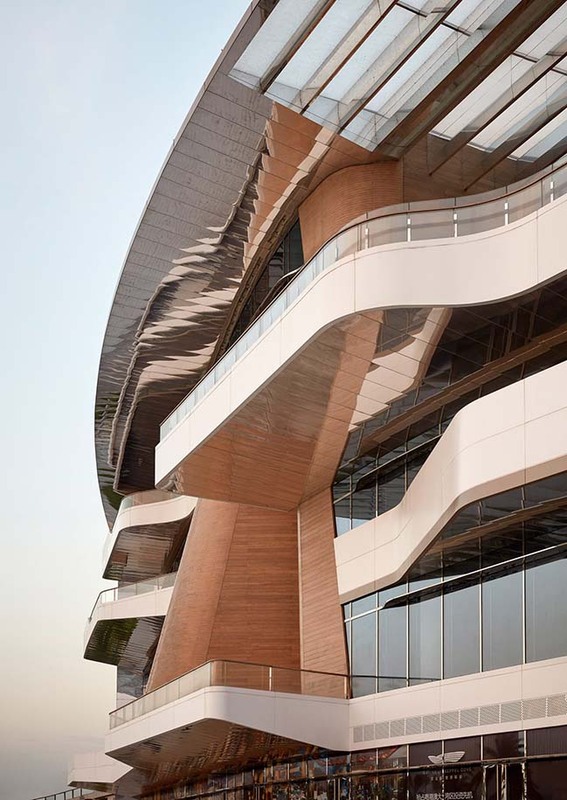 Alluding to the colours, materials and the craftsmanship employed in the skins of contemporary speedboats and yachts, the facade of the clubhouse consists of bronze coloured aluminium panels. 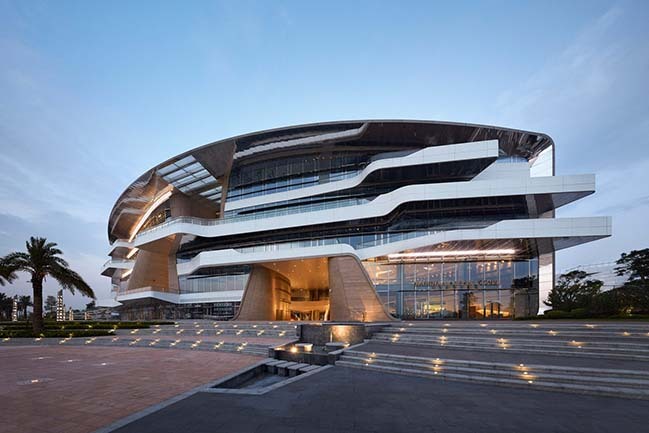 Often used in naval architecture, this bronze hue highlights the softness and fluidity of the building’s geometry. On the waterfront the entire facade is glazed and built up with glass fins for structural support. This facade includes several balconies that provide vista points and shading to the glazed areas. The undersides of the roof and the balconies are clad with mirror finishes which resemble sparkling reflections on the water’s surface. 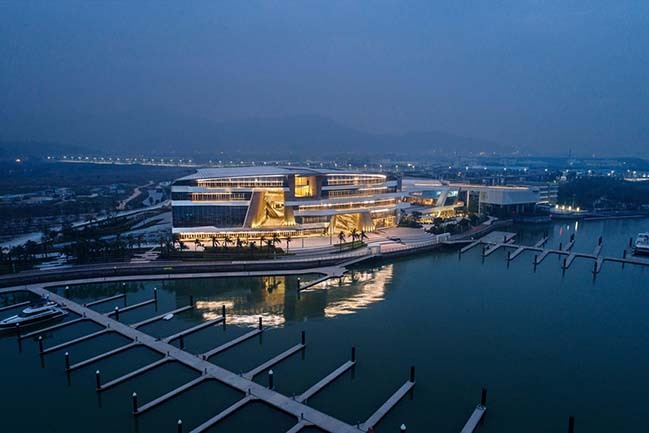 As a hub for maritime lifestyle activities, the marina offers various amenities for social interaction, for business, leisure and wellness, with the clubhouse building housing numerous restaurants, a members’ area, spa, gym, ktv and guestrooms. 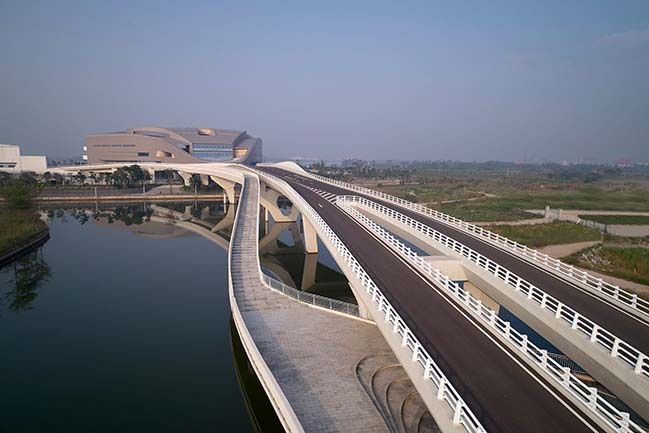 The bridge provides the main access route to the clubhouse and the waterfront. 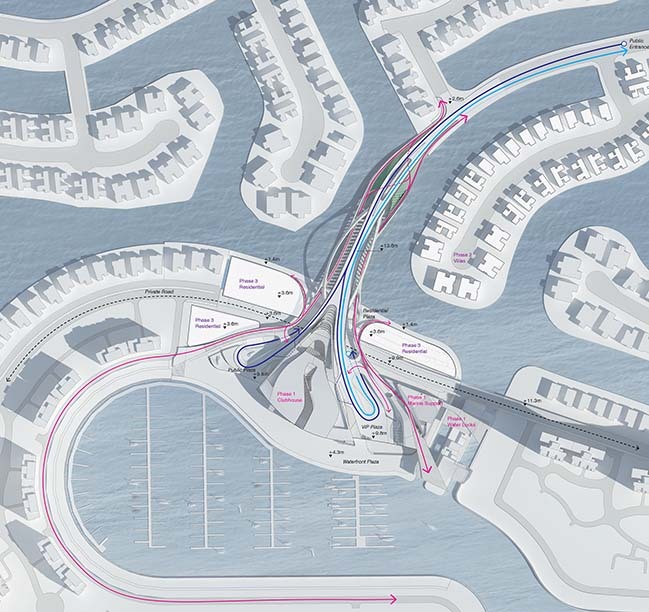 Pedestrian and vehicle routes are separated with a strong focus on the experience of the pedestrians. The walking level is located below the vehicular path and therefore sheltered from the view, fumes and noise of the cars. The bridge incorporates several platforms to rest or linger and above the dyke the handrail of the bridge transforms into a seating area - with the handrail of the vehicular path functioning as the canopy.